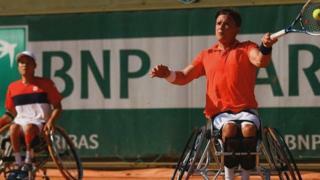 Britain's number one wheelchair tennis player Gordon Reid won his first Grand Slam singles title by beating Joachim Gerard 7-6 (9-7) 6-4 in the wheelchair final at the Australian Open. He has told Get Inspired how he started playing tennis "on his feet running around" as a six-year old in Helensburgh. The 24-year-old Scot contracted Transverse Myelitis when he 13. He spent six months in hospital and lost use of his lower limbs. He discovered wheelchair tennis shortly after this in 2005. For more information on how to get into wheelchair tennis, or any other version of tennis, take a look at our tennis .